The event and wedding planning industry requires a certain level of sophistication so it is important that the business cards also share these qualities. Our Dream team template does just that. 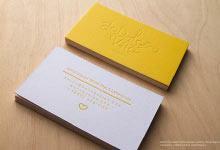 This template is crafted from our 29.5PT luxurious smooth white cardstock. This stock is enhanced by combining matte gold foil printing with full bleed, offset printing in a beautiful peach tone. This spot color ensures a rich but soft tone that is certain to portray elegance and opulence which is the exact message that should be portrayed in this industry. The matte gold foil printing is applied to both sides of the card adds a non-reflective shine that accents the company tag phrase, as well as the contact information on the back. This simplistic design is balances both delicacy as well as confidence to foster an overall astounding appearance.